While the wind blows and the snow flies in Colleen Thom’s old stomping grounds of Alberta, Canada, she and her husband Bill are enjoying their new life in a year-round paradise. For the last year Colleen and Bill have been living a life of warmth, friends, and adventure in the small Andean mountain town of Vilcabamba, Ecuador. The couple is supervising the construction of a two-story round house on the property as well. In the meantime, they rent a two-bedroom furnished house in town for just $225 a month including utilities. In fact, they live comfortably on just $800 per month. Much of their food comes from the Saturday organic produce market and the larger Sunday market in town. The year-round growing season makes for a huge variety of fruits and vegetables at rock-bottom prices. And if they don’t feel like preparing their own meals they can eat out for pocket change. “I can show you restaurants in town where you’ll get soup, juice, and a full plate of chicken or fish with sides for $2.50,” says Colleen. 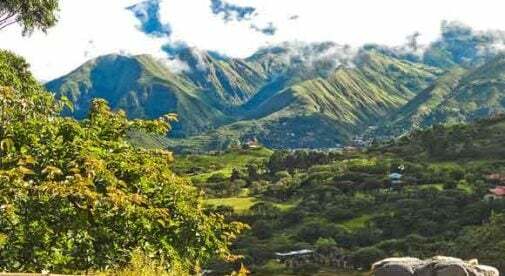 The affordability of living in Ecuador’s southern highlands is certainly appealing, but there is so much more that makes this feel like home for the Thoms. Other townspeople make Vilcabamba an interesting and cosmopolitan locale. “There are people from everywhere here,” says Colleen. “Chile, Argentina, Australia, New Zealand, Germany… It’s a real melting pot. And I’ve found the local people here so nice and so helpful and they’re just really great. “Entertainment here is very affordable. There’s always a concert or event going on,” she says. Colleen has also created her own entertainment by forming a dinner theater group. The members have fun putting on a show, the audience is treated to an enjoyable evening, and the proceeds all go towards local charities.